Milan, Italy’s DESTRAGE have just returned home from a successful performance at the Euroblast Festival in Koln, Germany (photos on facebook HERE) and are excited to get to work on their follow up to Are You Kidding Me? No., which was released in March of 2014. 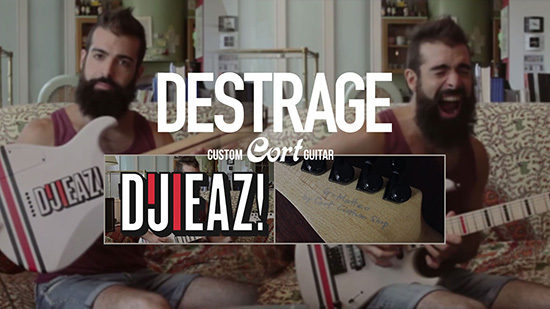 Additionally, Cort Guitars have designed a brand new axe for the band, which is detailed in a new video by guitarist Matteo Di Gioia on youtube.com/destrage HERE. DESTRAGE recorded Are You Kidding Me? No. at RecLab Studios with Larsen Premoli, and at Adrenaline Studio with Daniele Nelli. Mixing and mastering was done by Will Putney at The Machine Shop in New Jersey. The cover illustration was done by Marco Tafuri and the layout was completed by The Jack Stupid. Watch their official videos now on YouTube.